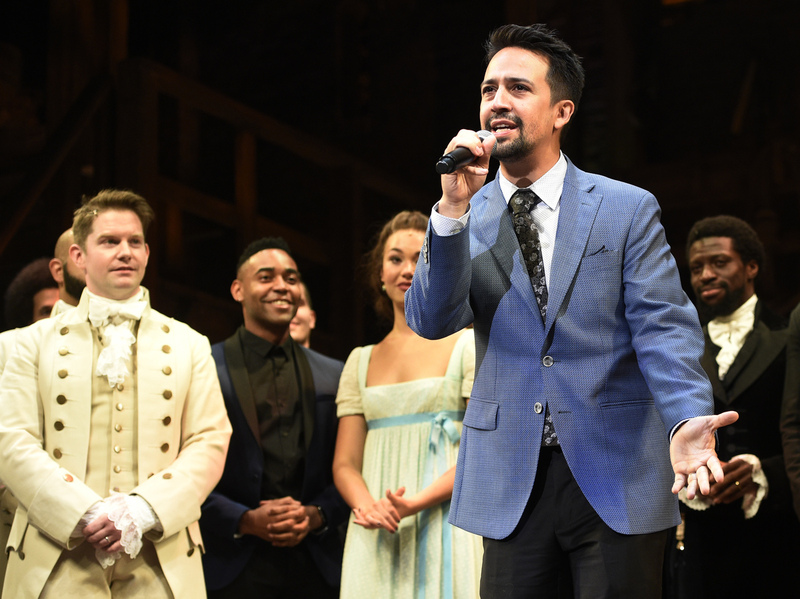 Auditions Begin For 'Hamilton' In Puerto Rico Playwright Lin-Manuel Miranda has promised to play the lead in a January 2019 production. Lin-Manuel Miranda addresses the audience on the opening night of the Los Angeles run of the show in August 2017. Composer and playwright Lin-Manuel Miranda begins his search Wednesday for the Puerto Rican cast of his Hamilton production that will take the stage on the storm-battered island in January 2019. His father, Luis Miranda, Jr., flew to Puerto Rico to help with logistics and tweeted the call for actors: "Seeking men and women, ages 20s-30s, for the non-white characters as written and conceived for the currently running and upcoming Broadway, Chicago and touring productions HAMILTON." The younger Miranda promised that he will headline the production on the island where his parents were born, even "if I have to play Hamilton with a f---ing flashlight under my face in one hand and a dueling pistol in the other." Since Hurricane Maria devastated Puerto Rico in late September, the playwright has aimed his star power at helping with recovery. He recorded a single, "Almost Like Praying," and donated proceeds from the song's release to the Hispanic Federation's Unidos disaster relief fund for the island. He also spoke on the steps of the Lincoln Memorial during a November protest against slow hurricane recovery. Hundreds of people signed up to audition Wednesday, but some empty slots remain. Candidates gushed their thanks to Miranda in their registration. One woman, Paula Lebrón, wrote: "Not throwing away this shot! So excited for this opportunity!!!"